Globe was founded in 1875 after prospectors discovered silver in the San Carlos Apache Reservation. Some of the silver nuggets had a globe-like shape to them. Globe was originally a mining camp and is called Besh Ba Gowah in western Apache which means, “place of metal”. By the 1900’s, many of the silver deposits were drying out and more copper was discovered in its place. Globe’s Old Dominion Copper Company was one of the riches mines in the world. 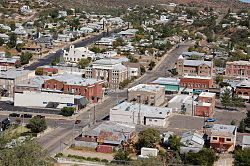 The mining camp was now a city with retail stores, banks, newspaper, and a stage linking it to Silver City, New Mexico. Globe enjoyed its popularity and continued to prosper. It did have a sordid past as well with many murders, stagecoach robberies, outlaws, lynchings, and Apache raids. Many famous names in history had ties to Globe such as Geronimo and Apache Kid. After being brought from the Arizona Territorial Prison in Yuma, the Apache Kid murdered Sheriff Reynolds when he was taken out of the stagecoach to walk up a hill. The Sheriff wanted to save the horses from any more strain but was killed in doing so. The Apache Kid’s trial was held in the Globe Courthouse on October 23, 1889. Other famous names such as the Clanton brothers, Ike and Phineas, also ended up in Globe after the gunfight at the O.K. Corral. The local sheriff trapped the brothers, killed Ike and arrested Phineas. After getting out of prison, Phineas decided to lay his hat in Globe where he died of pneumonia in 1906 and was buried in the Globe Cemetery. Globe has many historic sites and buildings within its city limits. Sharon and I are doing another ghost hunt at the Noftsger Hill School at the end of the month which now serves as a bed and breakfast. Last time we were there, Sharon heard a little girl talk to her and the chalk on the board move. This time we are doing a full-on investigation. We have lots more equipment and hope to see some action that night. We are also planning on doing some experiments at the Besh-ba-Gowah Pueblo ruins, and the old jail. We are hoping to see other historic sites Globe has to offer and as always, I will be sharing it all with you. I love the besha ba bewa. It is beautiful with the cactuses in front of it. I hope you hear more whispering girls on your next ghost hunt! I am determined to get that little gal to speak again. She woke me up several times during the night! This will be a wonderful trip and we have our nightvision cameras too so we can hopefully have samples of an investigation for others to view. Jessica; Besh-Ba-Gowah has a beautiful desert garden. I am hoping to capture more of it on our next trip. Sis; I am very excited to go this time because we have more equipment and we are conducting experiments. I just hope we can get into the jail too. good luck on your hunt; sounds like a great place for spooky goings on. don't forget to post your findings. Sandra; I will most definitely post photos and details of the entire trip. PLandS; totally mysterious and I love it! Very interesting...I look forward to hearing about the adventure. Barry, you are aways welcome to come along. You have plenty of time to fly out here before we go. Gail, I love sharing our trips, so you can bet I will be taking lots of pictures. LDML, the cacti are blooming nicely right now. Many are very colorful. Actually, Ike Clanton was killed near Springerville, not Globe. Big Nose Kate (Doc Hollicay's girlfriend) also ended up in Globe and I believe is also buried in Globe. I don't think that picture of the headframe is the Old Dominion. Just doesn't look right. From an Arizona native who grew up in Globe. Thank you for that bit of information. I appreciate it. I will be going back to Globe in a couple of weeks and will look for Big Nose Kate's grave and take pictures of the mine. Others showed the same picture I had and said was the Old Dominion Mine. If it is not the right picture, I want to be sure to get the correct one.